This new expansion brings over 150 new cards to your XenoShyft games (52 each of Wave 1-3 enemies, 3 emergency supplies cards, 12 full-art bosses (exclusive to the Kickstarter)). With new environments and new enemies comes new game mechanics. 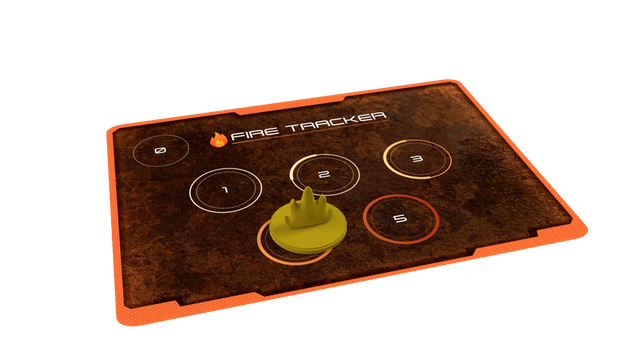 In this case, it's the Fire Tracker card. The new planet is full of Cinderkin who have evolved thinking that fire's just a mild nuisance at most. In fact, having more of it around can make them even more powerful. "Firepower" takes on a whole new meaning. As the amount of Fire grows, so does the power level of the Cinderkin. The new expansion isn't a full set on its own. You combine it with either Dreadmire or Onslaught (or both!) in order to play. The expansion is a $25 add-on to the current Kickstarter campaign. The Dreadmire campaign keeps chugging along with still 11 days left to go.